Mid to late April is the time to prune your rose bushes, provided there is no longer a threat of severe cold and freezing weather. Pruning roses is very important for a number of reasons. By cutting out dead and diseased wood you will be providing better air circulation for the plant as it grows which will help promote healthier leaf growth. Pruning also stimulates new growth which helps influence the quality and quantity of blooms. The pruning tips that I describe here apply to bush and shrub roses, not climbers. Climbers bloom on old wood, so the pruning technique is slightly different. It is best to use a bypass pruner, which helps ensure a cleaner cut. A fine toothed saw is also helpful for cutting large, dead canes. It is also very important to disinfect your cutting tools which helps prevent the spread of disease. This should be done with each cut if possible. At times I neglect to do this when making many cuts on the same bush, but it is very important to remember to sterilize your cutting tools as you move to another plant. I usually carry a can of Lysol disinfectant spray with me when I am in the garden. It is a convenient method of tool sterilization. Careful pruning will help give your rose bushes a better shape. Inspect the bush to note if any suckers have grown from the roots. This will be a cane that is growing away from the center of the bush. These suckers should be cut off at the root, as their growth can deplete the vigor of the rose bush. All dead, diseased, or broken canes should be pruned back to live wood which will be green and visible inside the cane. Also cut away canes that are thin or straggly as they will not be able to support flower blooms. If canes cross or rub, it is important to cut out the smaller one. Canes that are allowed to grow this way can create wounds for disease to breed. 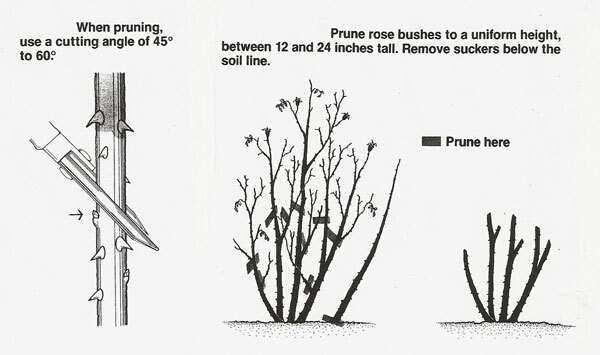 Pruning cuts should be made about 1 inch below dark-colored areas at a 45 degree angle. An easy way to think of this angle is to envision an L shape. Now cut that L into two equal parts with a diagonal line. That line would be your 45 degree cut line. These cuts would be made about a quarter inch above an outward facing bud. As you make these cuts, remember you are shaping the bush to a more uniform height. Old canes should be pruned back as close to the base as possible. Don’t get too carried away as you prune out canes from the center of the bush. The idea is to improve air circulation but it doesn’t mean that all the center canes should be removed. My first pruning attempts found me quite unsure of my efforts. I can tell you that rose bushes are quite forgiving. 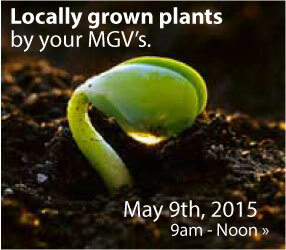 Each spring you will gain more confidence in your pruning abilities. April is National Gardening Month. “Suddenly It’s Spring in the Herb Garden” is a Master Gardeners project currently on display at the library. (The original article is several years old and this project is not currently on display). 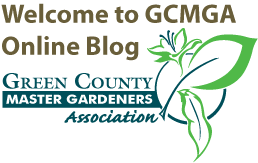 Master Gardeners are also available to help answer home gardening horticulture questions by calling the UW Extension office at 328-9440.